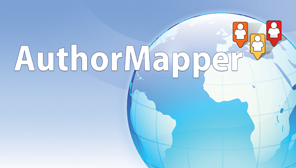 AuthorMapper searches journal articles and book chapters and plots the location of the authors on a map. Begin a search by entering keywords in the search box, or browse by subject collections. Advanced search features offer additional refinement options, including a filter for displaying open access articles. Search results are complemented by graphs, timelines, and keyword tag clouds that visually summarize the data and can also be selected to further refine your search terms. AuthorMapper searches the Springer Journals and Springer Books collections and offers access to nearly one hundred fifty years of content available on SpringerLink. Comprehensive coverage includes both current and archival content in all major subject areas including life science, medicine, engineering, mathematics, computer science, business, and law, contributed by the world’s best academics, including many Nobel Prize winners. AuthorMapper is a powerful knowledge discovery tool that provides unique insights into scientific literature. ORCID® identifiers: Where available, we try to indicate that a given author has an ORCID identification id. For more information on ORCID identifiers, please visit the ORCID About page.